April 2019 I'm just back from a week in Siena, and adding and updating like fury. along the main route into town from the Camolia gate. The rest that are regularly accessible can be counted on one hand. San Giorgio, Santo Spirito, San Niccolò al Carmine, San Pietro a Ovile and San Girolamo, to name just six. Built with locally-provided funds from around 1657, to designs by Giacomo Franchini, with stucco decoration by Pietro d'Austo Montini. Deconsecrated in 1813 the oratory became an armoury but is now used by the chiociolla (snail) contrada as their horse house, where the horse chosen for the palio is kept for the three days before the race. This had been the contrada's oratory, until it moved to the oratory of Santi Pietro e Paulo, along with the art and fittings from here, which included an icon of the Virgin painted by Jacopo di Mino del Pellicciaio. On the façade, a stucco God the Father with Angels is set above a repainted fresco of the Virgin and Child painted in 1742 by Francesco Feliciati. 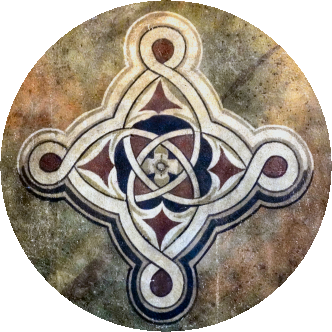 Below this is a fresco of a snail. 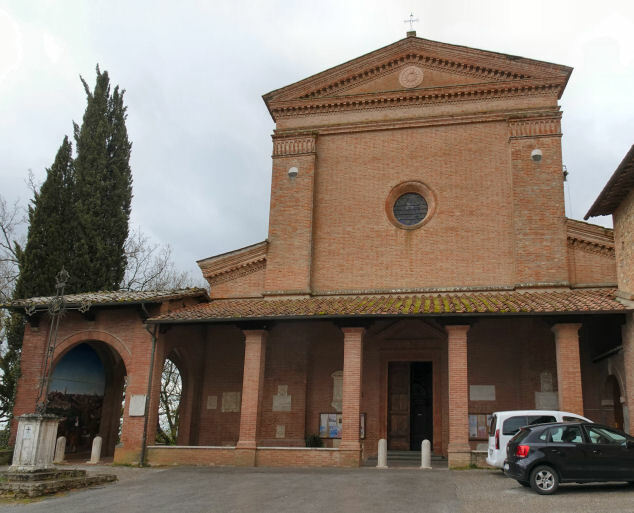 In 1441 the church passed to the Convertites, who called it Santa Maria Maddalena Penitente and who were here until the suppression of the religious orders by Napoleon in 1809. It was under the management of the Convertites that the church was much remodelled. After the transfer of the church to the Diocese it was dedicated to Maria Santissima del Rosario of Pompei . The remains of 14th-century school-of-Lorenzetti frescoes in the vault of The Evangelists and on the right wall of The Martyrdom of St. Lawrence. The Virgin Presenting Christ to the Magdalene in the dome is by Annibale Mazzuoli . 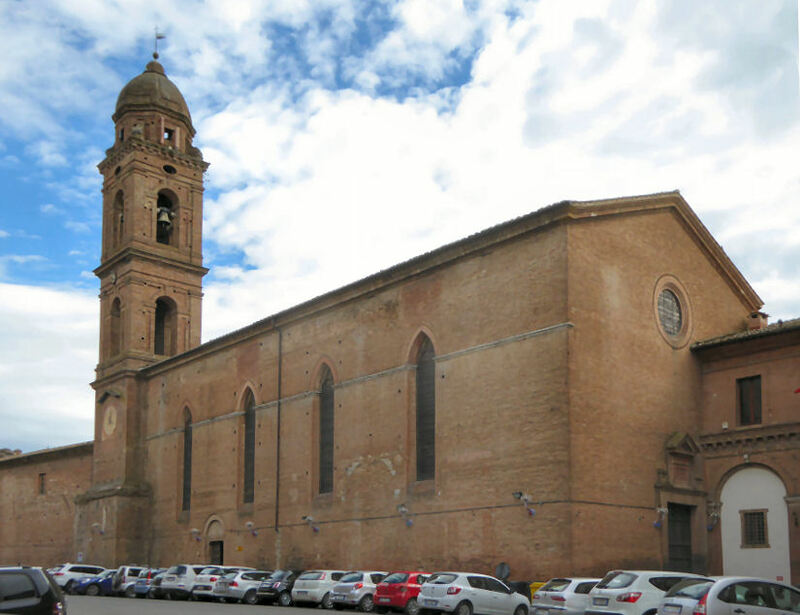 The current site was obtained between 1836 and 1838 by combining the oratories of Sant'Antonio Abate (belonging to the company founded around 1250 by the blessed Andrea Gallerani ) and the Madonna della Stella. 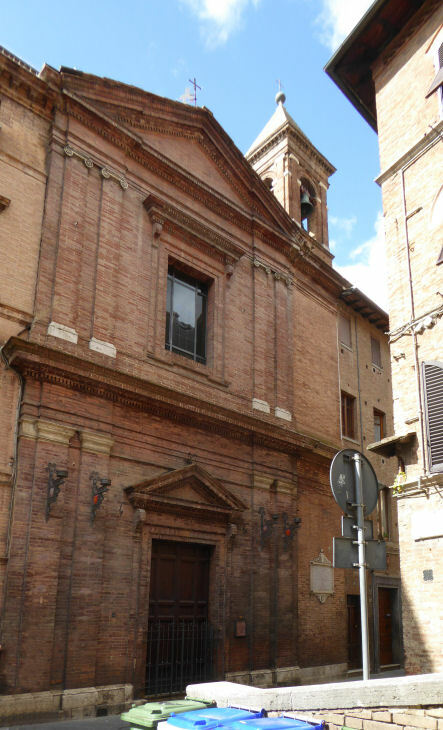 Even today it is the oratory of the Confraternita della Misericordia di Siena, which is located in the same site in via del Porrione in Siena. Entry is via an entrance narthex shared with the hospital where funeral litters are displayed. There's a small dome over the entrance hall at the rear of the oratory, where to the left and right in niches there are The Annunciate Angel and The Virgin, separate polychrome statues by the late 16th-century sculptor Domenico Cafaggi, having previously been attributed to Marrina. 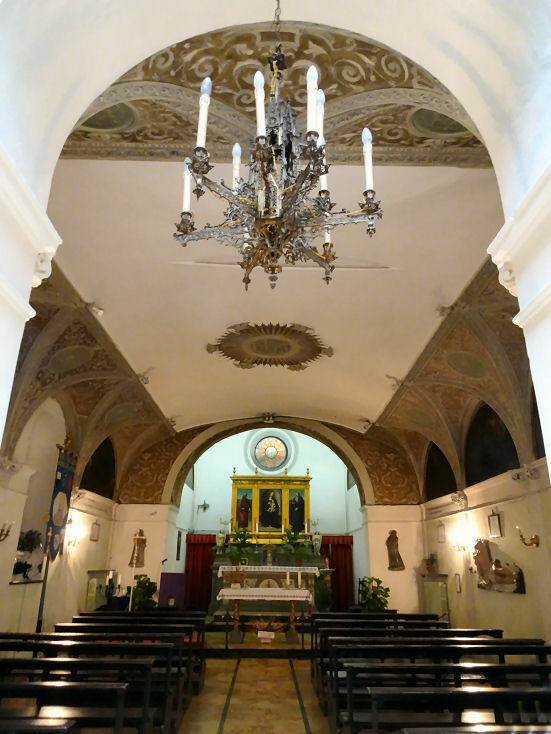 The oratory is very small, with a flat ceiling much decorated in a frieze below, with seven lunettes. These show Stories of Saint Anthony Abbot executed in the late 16th/early 17th centuries by a team consisting of Alessandro Casolani, Francesco Vanni, Pietro Sorri, Rutilio Manetti, and Sebastiano Folli. But it is too dark inside to see them well. There are two more lunettes in the shallow rectangular apse. Over the high altar is a triptych of The Madonna Child with Saints Anthony Abbot and Paul, an early work by Girolamo del Pacchia (early 16th century ). On the first floor, in the Council Chamber of the Archconfraternity, there are said to be coffin heads painted by Guidoccio Cozzarelli and Domenico Beccafumi and a Portrait of Bartolomeo Carosi by Pietro Sorri . More than a touch of Brunelleschi, with three stout pillars each side, separating the nave from the four side chapels each side with round pietra serena arches. A large detached fresco and its sinopia are just visible either side of the apse, behind the panelled and benched choir with its dome. The fresco looks like an Enthroned Virgin. The church has works by Andrea della Robbia - an Annunciation pair of statues either side of the choir arch and a Coronation of the Virgin (see right) in the second chapel on the left, plus two tondi in the counter-façade, depicting San Ludovico di Tolosa and San Bonaventura. Also a triptych once ascribed to the Master of the Osservanza (and the label attached still says so), but this anonymous master was in 2010 identified as the young Sano di Pietro. He was originally called The Master of the Osservanza Triptych after this very painting. It depicts the Virgin and Child with Saints Ambrose and Jerome, is dated 1436, (fourth chapel on the right) and was commissioned by merchant Manno di Orlando for his chapel in San Maurizio. Also by Sano di Pietro here is the Virgin and Child with Saints Jerome and Bernardino painted a little later (third chapel on the right) and a Virgin and Child with Angels panel (first chapel on the left). A polyptych by Andrea di Bartolo (part of a dismembered work) depicting eight saints including, on the main register, Saints John the Baptist, Francis of Assisi, Peter and John the Evangelist (1413) (fourth chapel on the left). 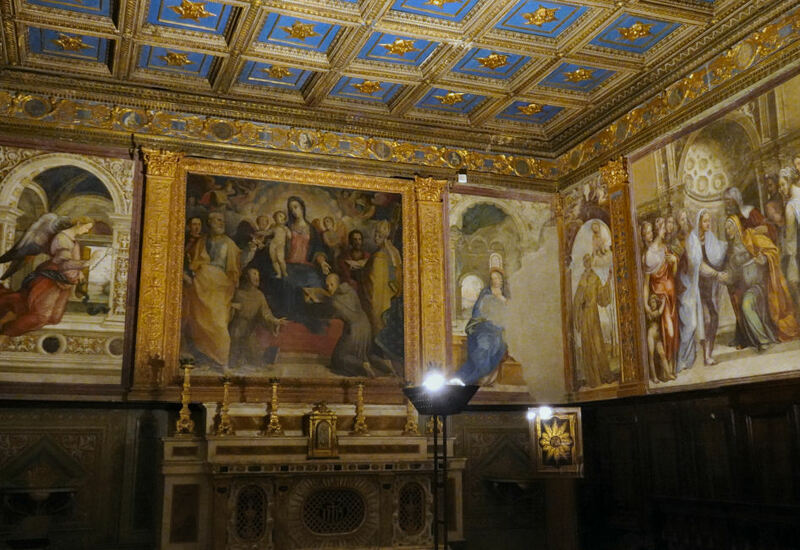 In the first chapel on right is a detached damaged fresco of The Crucifixion by Bartolommeo Neroni, called il Riccio, who also painted the same subject, with saints, on a panel in the third chapel on the left. In the crypt, with its reverse orientation to the church, are tombs of the Petrucci family, including the remains of Pandolfo. There are three cloisters, the largest dates back to the last quarter of the 17th century , with an 18th-century well from the centre. The oldest is the southern cloister, currently without its southern wing, which is overlooked by the Pandolfo loggia. In the refectory there is a large canvas by Francesco Franci of The Last Supper from 1710. On the altar of the sacristy there is a late 15th/early 16th century polychrome terracotta sculptural group depicting The Lamentation by Giacomo Cozzarelli . Next door to the sacristy there is the museum dedicated to Aurelio Castelli, which houses various works. These include the head of a processional Crucifix made by Lando di Pietro in 1388 and belonging to the Sienese Compagna di San Domenico. It came here when that order was suppressed in 1785 and used to be over the high altar. Only fragments remain following the allied bombardment in 1944. The destruction revealed a parchment strip signed by the artist in 1338 asking us to worship the son of God, not the wood. and the reliquary of St. Bernardino of Siena (mid- fifteenth century). The Dittica dell'Osservanza (see below) by Paolo di Giovanni Fei is in the Pinacoteca. As is a cut-down Annunciation panel by Martino di Bartolommeo. Also panels by the Master of the Osservanza/Sano di Pietro, including San Bernardino and two angels. 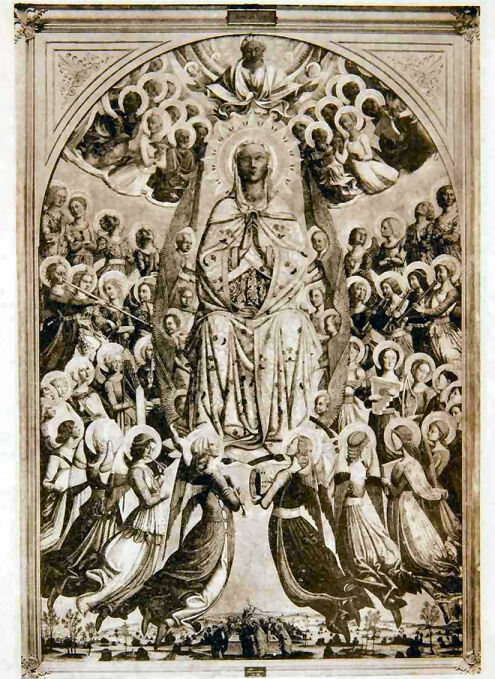 A high altarpiece depicting the Assumption, probably commissioned by Bernardino himself, from Sassetta, which was lost in the Berlin Flakturm fire in 1945. (See b&w photo right). Christ Stripped of His Garments by Francesco di Giorgio Martini is now in the Pinacoteca (no.428). The ground floor (entrance) chapel has scenes from The Life of San Bernardino painted in the 17th century by Ventura Salimbeni, Rutilio and Domenico Manetti, Crescenzio Gambarelli, Bernardino Mei and Deifebo Burbarini. The ceiling fresco with a view of Siena, Arcangelo Salimbeni's The Virgin Protecting Siena with Saints Bernardino and Catherine was completed in 1580 by Francesco Vanni. There's a late-14th-century antiphonal in a glass case at the back, illuminated by Lippo Vanni. 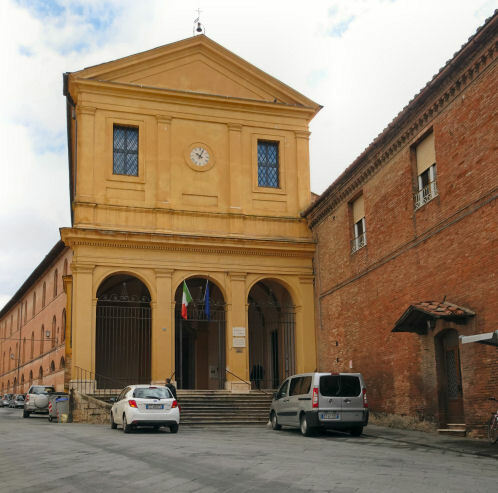 The attached Museo Diocesano consists of five small rooms containing religious art from the 13th to 17th centuries well displayed. The collection includes works by Vecchietta, Ambrogio Lorenzetti and Matteo di Giovanni. The Madonna and Child with two Angels panel of 1262, now mostly accepted as by Guido da Siena, was owned by the Compagnia di Santa Maria degli Angeli and kept here. It is now (no.16) in the Pinacoteca. but admission is only with an OPA Si Duomo Complex pass. A church with Romanesque (11th/12th-century) (or even Roman) origins but rebuilt after the earthquake of 1798, when the façade collapsed. The building was shortened at this time, with a neoclassical brick façade added in 1800. The church's cloister was used for comune meetings before the building of the Palazzo Pubblico, so it was here, in 1260, after a meeting with Florentine ambassadors, that the Gran Consiglio made the decision to go to battle with the Florentines at Montaperti. which proved to be such a historic victory for the Sienese. 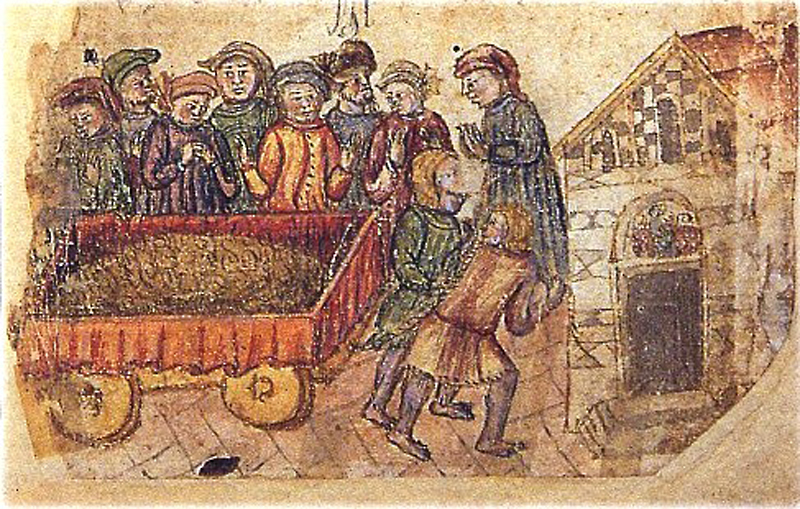 Following the subsequent decision to hire German mercenaries Salimbene Salimbeni, who was a banker and founder of the early version of the future Monte dei Paschi, walked home to his nearby palazzo and returned here with the wheelbarrow full of 118,000 florins, an event illustrated in the illumination below (ms. A.IV.5, Siena, 1444). 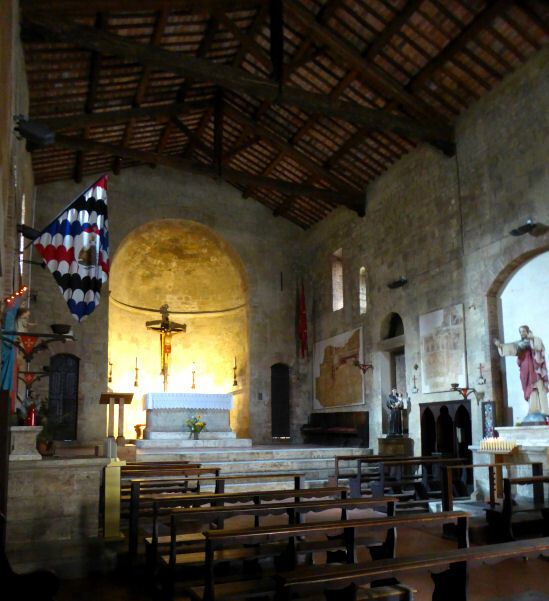 It is also said that in 1376 Saint Catherine of Siena forced a reconciliation here between the feuding Maconi and Tolomei families. This she achieved by going into an ecstatic trance whilst praying at the altar. 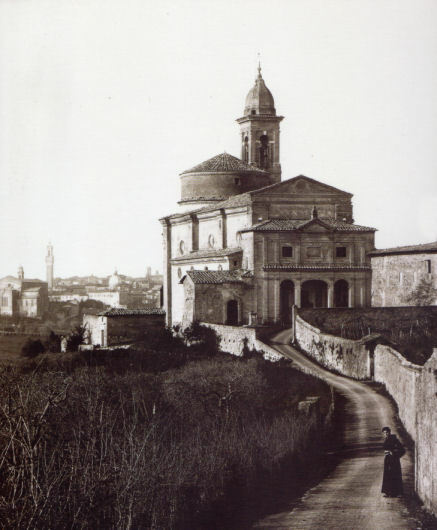 From 1796 to 1945 the church was also the headquarters of the Contrada della Civetta, who still have the patronage on the first altar on the right, dedicated to Saint Anthony of Padua, the patron saint of the contrada. The temple-front façade of 1800 was designed by Tommaso and Francesco Paccagnini and would originally have been covered with painted plaster. The two statues of 1802 are Bernardo and Nera Tolomei by Giuseppe Silini. Bernardo was the founder of the Olivetan order and the impressively gothicly looming Palazzo Tolomei (now a bank) is opposite the church. Aisleless and pale inside, due to plain white walls. The buff-colour columns and pilasters separate three arched bays each side, with a real or trompe l'oeil clerestory window in each. Two altars face each other in the centre of left and right walls of the nave. On the right there's a carved Crucifix with a painted standee of a bishop saint. On the left a dull but serene Madonna and Child with Saints Luke and Romuald (c.1508) by Girolamo del Pacchia. There is a reproduction of the Saint George panel (see Lost art below) in the last bay on the right, with another reproduction, an accompanying same-height narrow panel of Saint Christopher. The latter panel is now not thought to be from the same polyptych. Hidden in the left transept is a fresco of the Pietà with the instruments of the Passion by Martino di Bartolomeo (see right). 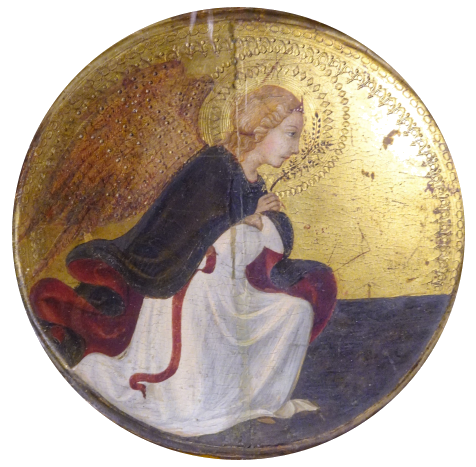 A primative-looking late-13/early-14th century tondo of the Virgin and Child by the Maestro degli Aringhieri. 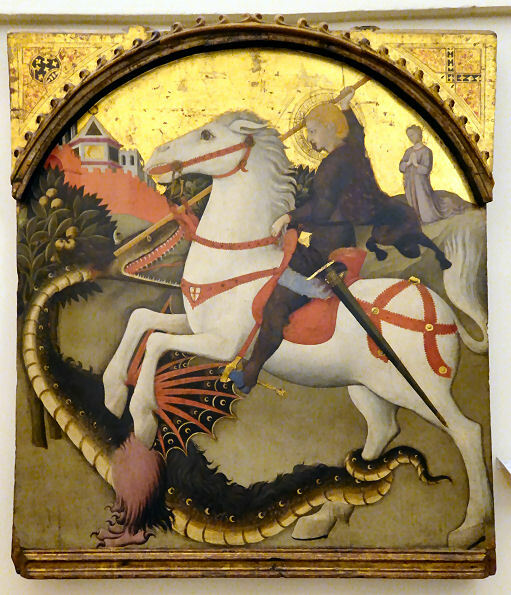 The Saint George and the Dragon altarpiece painted by Sano di Pietro in the 1440s (see right) in remembrance of Giorgio Tolomei, who had been a rector here, for the family chapel here, is now in the Diocesan museum and the Vatican. It has also been attributed to the Master of the Osservanza (who is now often said to be Sano di Pietro) and to both of them working together, by some scholars who think them separate artists. The dragon is striped with half-moons, a symbol of the Tolomei family. Two panels from a predella are in the Vatican Museum, one showing Saint George Preaching to the King of Silena the other Saint George Baptising the King of Silena. In the same room in the Diocesan Museum is a same-height narrow panel of Saint Christopher, by the same artist and from this church but now not thought to be from the same polyptych. A 15th-century della Robbia Virgin and Child and a tondo of the Virgin and Child by the Master of San Pietro a Ovile. 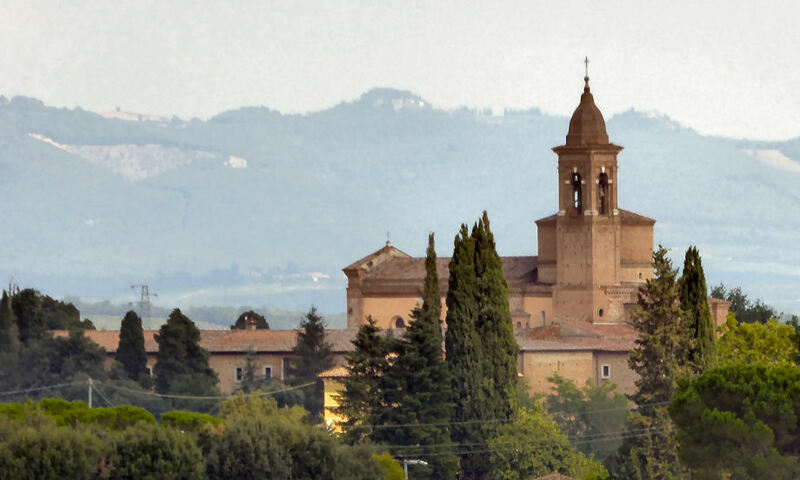 Built in 1119 as the Abbadia di San Michele, passing swiftly to the Vallombrosan and in 1565 to the Cavalieri di Santo Stefano. These last two orders have their coats of arms over door. By 1682 it had passed to the Carmelites who did much work on the church. On the right wall as you enter are fresco fragments possibly from the 12th century church. A Crucifix signed and dated 1345 by Niccolò di Segna, now in the Pinacoteca. It is said to come from 'the Vallombrosan church of Santi Michele Arcangelo e Benedetto' which seems to fit with here. A Donatello-inspired Pieta carved in walnut and polychromed, and early sculpted work by Vecchietta is now in the diocesan museum in the oratory of San Bernardino next door to San Francesco. Oratory built 1683-1700 for the Contrada del Nicchio (seashell). On the façade was a venerated early 14th century painting of the Madonna of the Pitchfork in a shell shaped stucco niche, now replaced by a copy. 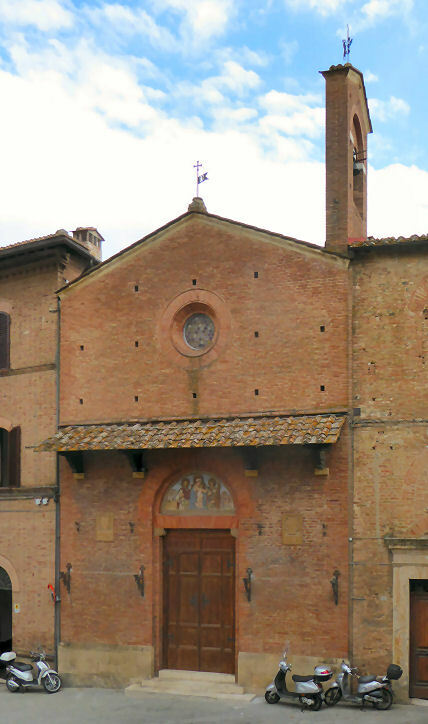 The contrada museum and headquarters are behind the church. Before the Palio races of 2nd July and 16th August the blessing of the contrada's horse takes place inside the Oratory. The ceiling was frescoes are The Theological Virtues by Giuseppe Nicola Nasini and Stefano di Francesco Marzi, his pupil; the work being completed in 1734 by Apollonio Nasini to his father Giuseppe's designs. Stucco work of 1686 -1705 by Giacomo Franchini, including statues of the Blessed Ambrogio Sansedoni, in the first niche on left, and San Gaetano (Saint Cajetan) in the second niche on the left. On the right are Saint Vincent Ferrer and The Blessed Giovanni Colombini. 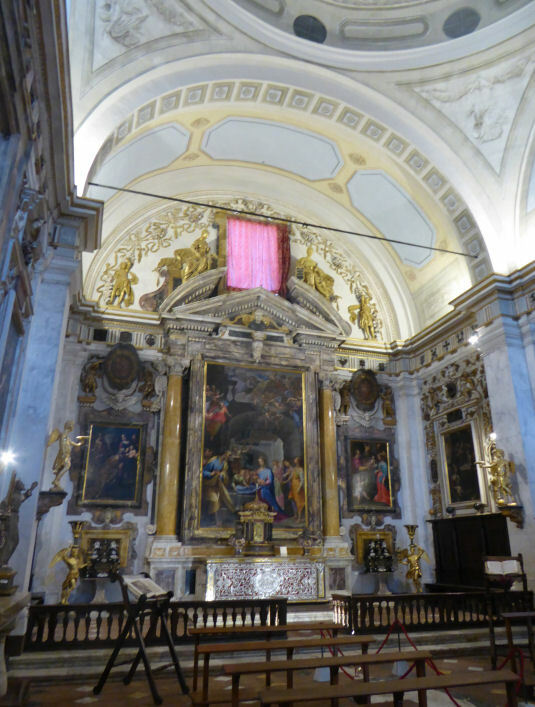 Beside the altar are Saint Bernardino and Saint Caterina of Siena. 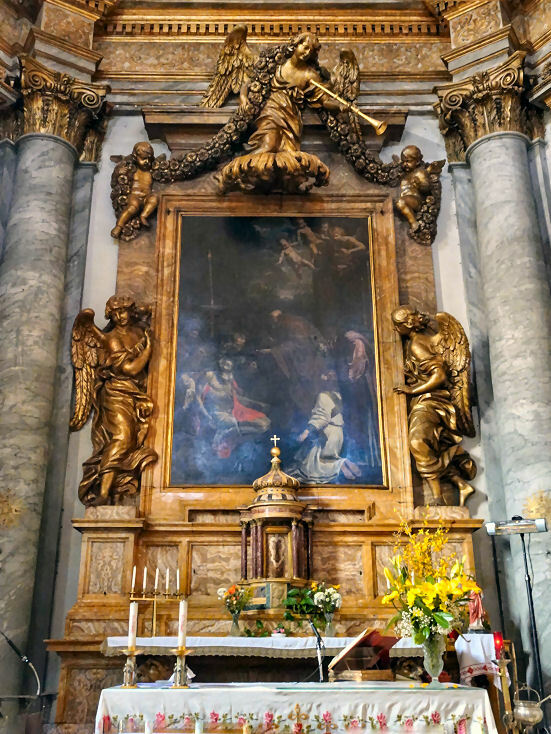 The high altarpiece of San Gaetano of Thiene Persecuted During the Sack of Rome of 1825 by Luigi Boschi recently returned to the oratory following restoration. Named for Saint Hyacinth, a 13th century Polish Dominican missionary. 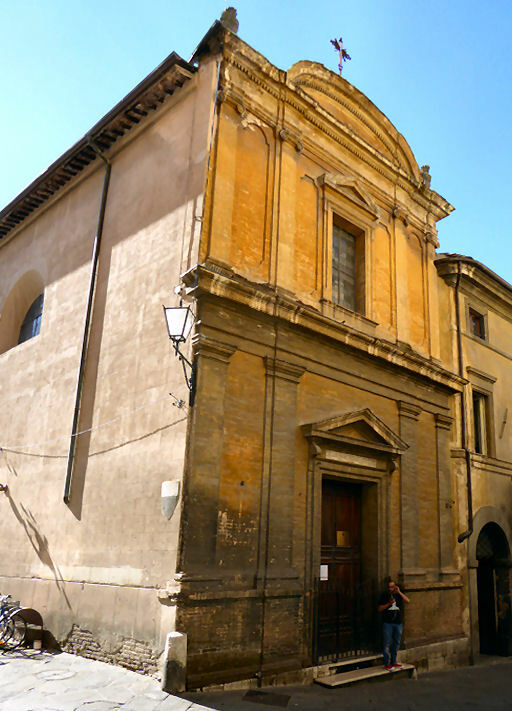 This church was attached to a Dominican convent, called of San Giacinta di Vita Eterna, where the nuns ran an adjacent orphanage. 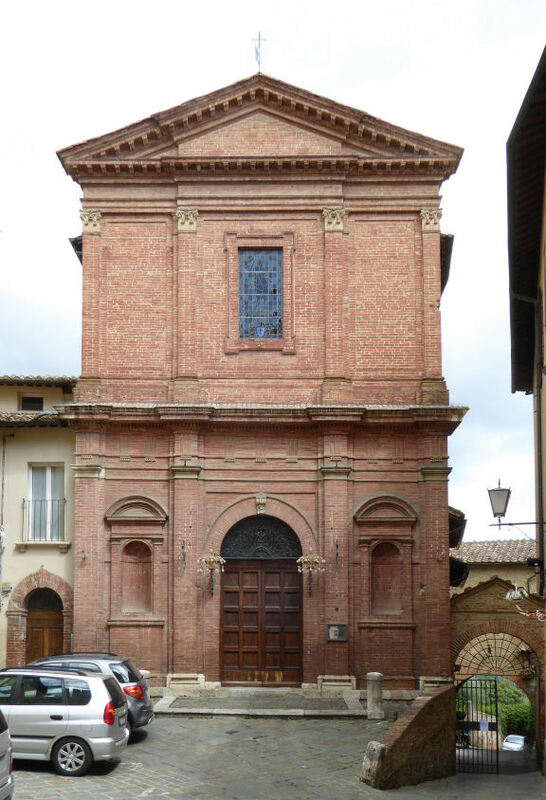 In 1528, it became the oratory of the Confraternity of Sant'Emidio, a lay confraternity which still exists. The church was deconsecrated and is now used by a Romanian congregation. The convent became a home for poor widows in 1852. Above the door in the plain brick façade is a weathered fresco by Francesco Rustici (il Rustichino), who also painted the high altarpiece inside - Saint Hyacinth Healing the Two Blind Boys, signed 1615, for which a drawing exists in the Ashmolean Museum in Oxford. On the right is an altarpiece depicting the Mystic Marriage of Saint Catherine of Siena by Cristofano and Vincenzo Rustici, the uncle and father respectively of Francesco. On the left is a Madonna del Rosario sometimes attributed to Niccolo Nasini, but also said to be a 17th century copy of a lost original by Fra’ Paolino da Pistoia or Bartolomeo della Porta. Above the door to the convent is a fresco of The Madonna attributed to il Brescianino. The original church here was built between 1532 and 1536 to commemorate victory over the papal and Florentine troops in the Battle of Camollia of 1526 The battle took place on the 25th of July 1526, which was the feast day of St. James the Greater, hence the naming of the church. The original 16th-century church was rebuilt c.1665 and reconsecrated in 1702, on the 25th of July 25 of course. The façade was also rebuilt during this work but this work was reversed in the late 19th century by Sienese architect Giuseppe Partini . Now the Oratory of the Contrada della Torre (tower). Aisleless. The vault fresco is the Glory of Saint James (1700/02) by Dioniso Montorselli with stucco work by Iacomo Franchini from the same period. The oldest work here is a Virgin and Saints Giacomo and Cristoforo (c.1545) by Giovanni di Lorenzo, on an altar on the right. This work celebrates the battle of Camollia on July 25th as this is the feast day of Saint Christopher as well as of Saint James. On the high altar is the Martyrdom of St. James, signed and dated 1605 by Rutilio Manetti. There's also a Crucifixion from the Certosa di Maggiano, from 1625. Also some late 17th century works mostly celebrating Saint James. The adjacent contrada museum has Sodoma's Way to Calvary from c.1546, thought to be one of his last works. 1901, attributed to Agenore Socini who also built the church of Sant'Elisabetta della Visitazione. Tradition has it that there's been a church here since the 11th century and that the church was then rebuilt with donations from the German mercenaries who fought alongside the Sienese in the Battle of Montaperti in 1260 against the Guelf Florentines, where it is said the Sienese side had called on Saint George for help. 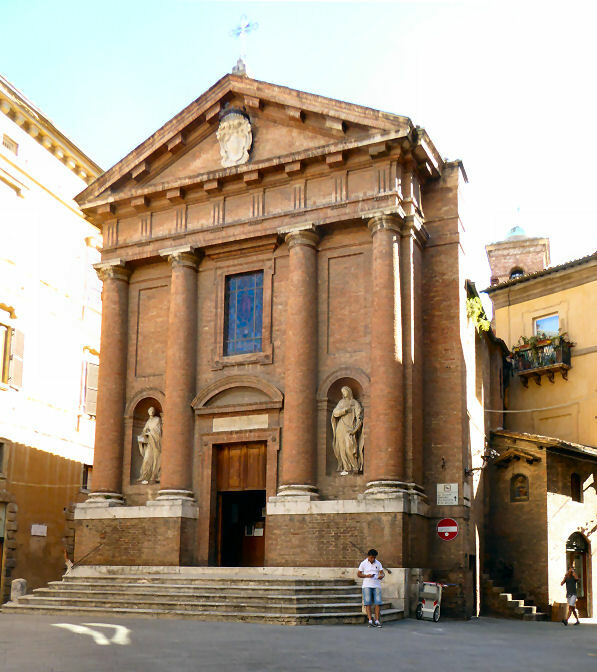 The current Baroque church is the work of Pietro Cremini, was consecrated in 1731 and finished in 1738. 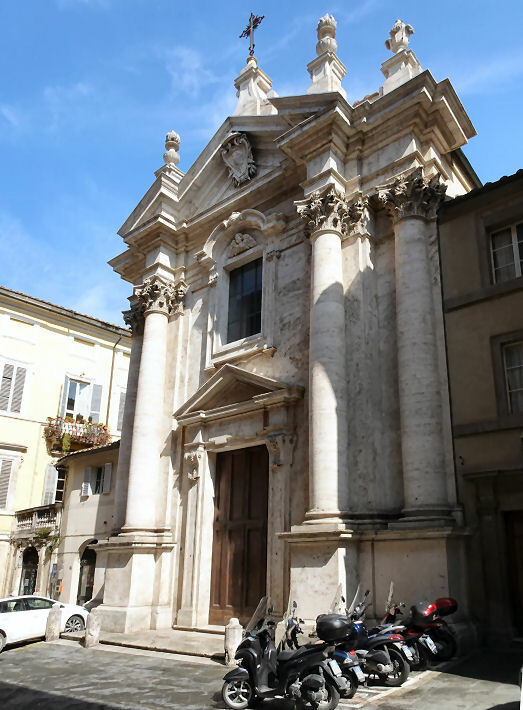 The travertine marble façade features the coat of arms of Cardinal Anton Felice Zondadari, the patron of the rebuilding. In the transept are the tombs of two member of the Zondadari family. 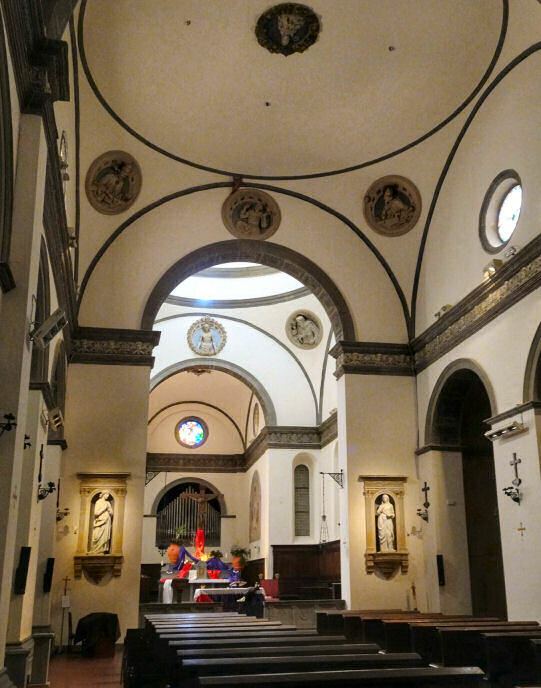 There's a Crucifixion with Father Matteo Guerra of 1738 on the second altar on the left and a Pietà with Saint Catherine in the right transept, both by Francesco Vanni, who is buried here - his polychrome tomb of 1656 is to the left of the main door on the inner façade. His bronze bust here is the work of his sons Raffaello and Michelangelo, the latter also being responsible for the marble panel. Michelangelo Vanni, the elder son is said to have completed the Crucifixion with Father Matteo Guerra, while the Encounter of the Lord with his Mother on the Calvary was painted by Raffaello. The high altarpiece depicts St George and the Dragon by Sebastiano Conca. An Immaculate Conception by Ventura Salimbeni, half-brother of Francesco Vanni, is now in the Diocesan Museum. Legend has it that the original building on this site was an ancient temple of Jupiter. A 13th century Romanesque church here was rebuilt in the first half of the 16th century. It was dedicated to St John the Baptist, for the lay company of of St. John in Pantaneto. The architect was possibly Giovanni Battista Pelori, a pupil of Baldassarre Peruzzi, who may have been responsible for the initial conception. 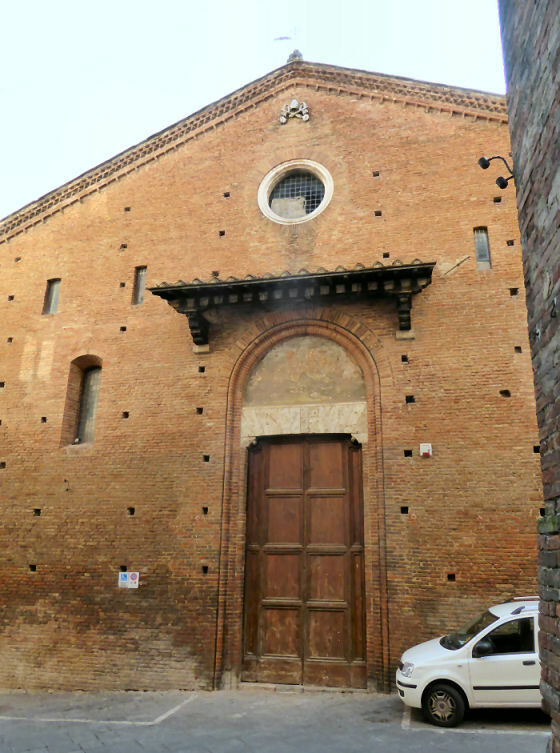 The brick facade was completed by 1537, but the completion of the body of the church wasn't achieved until the 1590s. Fresco decoration inside was commissioned from 1590 to 1650. 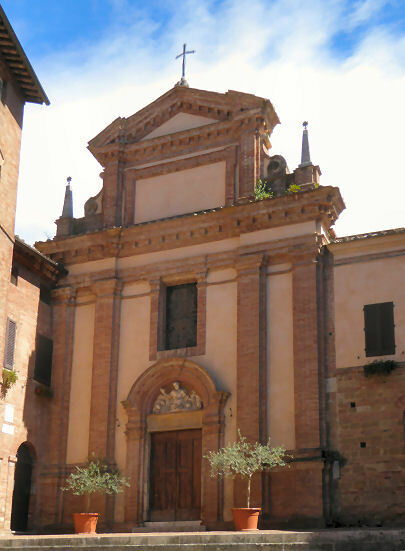 The church was consecrated on the 10th of May 1611 by the bishop of Grosseto, Cesare Ugolini. The Contrada del Leocorno has been associated with the church for more than three centuries. The nave ceiling vault fresco is the Glory of St John the Baptist by Dionisio Montorselli. Above the wood panelling of the choir around the nave are thirteen framed canvases by various artists, depicting Stories of the Life of John the Baptist. The painters include Dionisio Montorselli (the Annunciation), Rutilio Manetti (4 canvases including the high altarpiece of The Baptism of Christ (which Manetti had to come back and enlarge after the installation of the new altar in 1609), John the Baptist declares Christ to the Pharisees), Domenico Manetti, Giovan Battista Giustammiani, called il Francesino, (Burial of John the Baptist) Bernardino Mei (Beheading of the Baptist) ; Raffaello Vanni (St Zacharius at the Temple), Deifebo Burbarini (Saint Francis), and Astolfo Petrazzi (Beheading of Saints John and Ansano). Some works have been attributed to Angelo di Niccolò Tegliacci (The Baptist led to Prison), Cristoforo Rustici, Niccolo Nasini, and Tornioli (The Banquet of Herod). The polychrome marble high altar (1609) was built by Flaminio del Turco. There is a small 14th-century Madonna della Pace by Francesco di Vannuccio. In the entrance hall is a terracotta statue of the Baptist by Guidoccio Cozzarelli and a canvas depicting The Glory of Saint Joseph by Deifebo Burbarini. 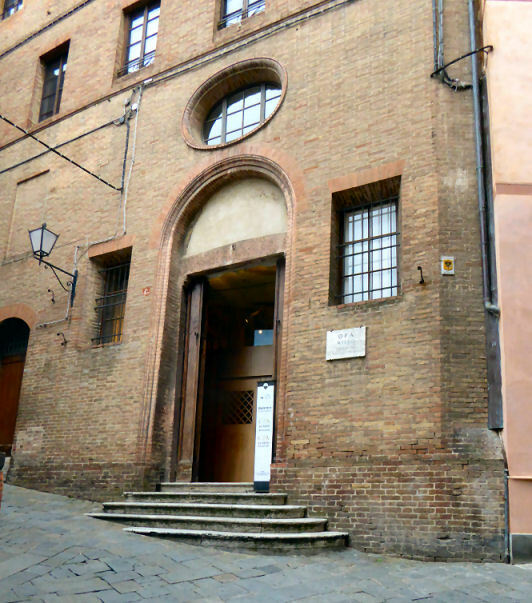 The first Jesuit (Gesuiti) convent in Siena, it passed to the Vergini Abbandonate (Destitute Girls) when the Jesuits where suppressed and then to the Figlie della Carita di San Vincenzo de' Paoli, the current occupants. Black and white striped interior. On the back wall of an antechamber left of high altar is a Coronation of the Virgin by Sano di Pietro, who became the Jesuit order's official artist. The Virgin is flanked by Saint Jerome and the Beato Giovanni Colombini, the latter being founder of the Gesuati order. He came from a wealthy Sienese family but renounced worldly pleasure at 40, embraced poverty and hardship and established the order. A monochrome Crucifixion (1448?) by Michele di Matteo. The cloister contains an arched panel of the Assumption of the Virgin by Fra Giuliano and Bernardino Fugai, who also painted the frescoes in the surrounding niche. 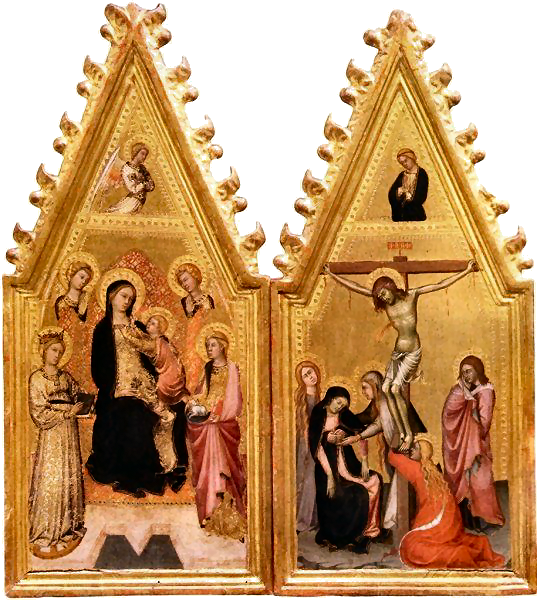 The spectacular Polyptych of the Gesuati (also known as the Polittico del Beato Colombini) (see above) by Sano di Pietro is in the Pinacoteca, but its predella is in the Louvre. He also painted a Madonna and Child with Saints, with a predella of Episodes from the lives of Saints Cosmas and Damian. The first (246) is his earliest known signed work, commissioned in 1439 and completed 1444, when he was nearly 40. It underwent restoration for the 2010 exhibition “From Jacopo della Quercia to Donatello: the Arts in Siena in the early Renaissance”. The second (233) is from 1446. 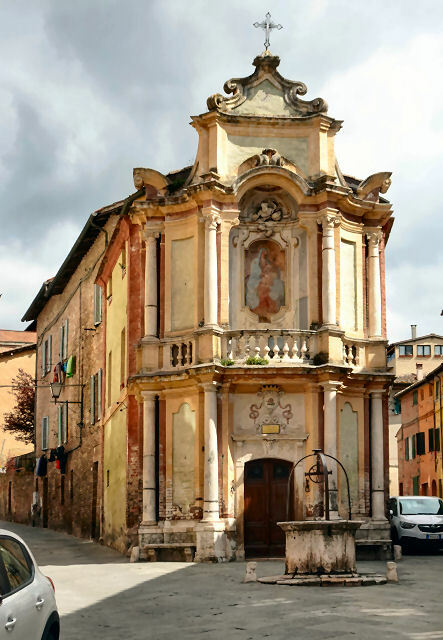 A Baroque-style church, part of a monastery has been converted to a nursing home (Casa di Riposo) for the elderly. Originally established by a group of Franciscan woman in the late 13th/early14th century. The republic gave them some houses here, a district notorious for prostitutes. Only in the 1420s was a monastery built and in 1473 the nuns obtained permission from Pope Sixtus IV to build an oratory. In 1575 the convent housed some 77 women. Following official recognition by Cardinal Metello Bichi in 1613 it soon became popular amongst the aristocracy for the cloistering of daughters, like Berenice, daughter of Agostino Chigi, who took the vows of the Poor Clares in 1683. Construction of the church began in 1683. It was built perpendicular to the former oratory. The convent was suppressed by Napoleon in 1808, but re-opened in 1816, only to be finally suppressed in 1874. In 1889, it became 'an asylum for abandoned elders' and so has had many modifications over the last two centuries. 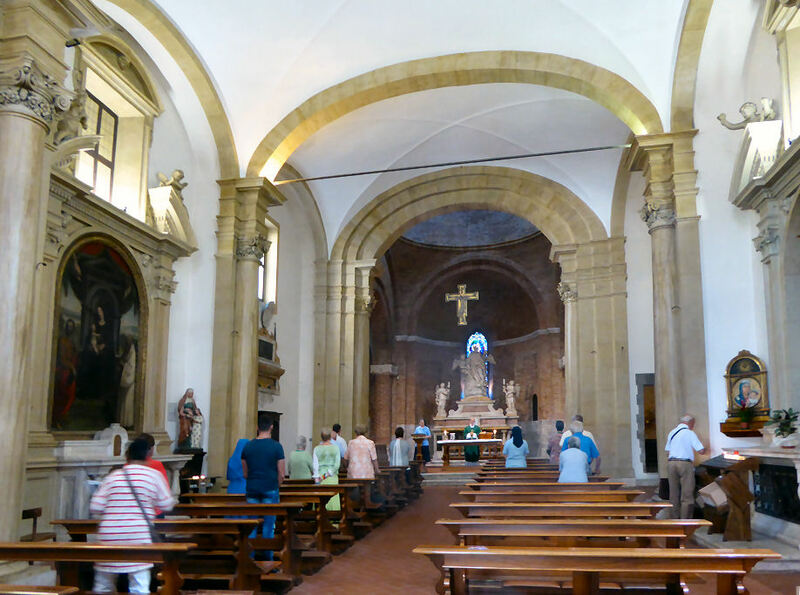 A wide church, with no aisles and just a pair of side altars in shallow niches. Very baroque but with tastefully dull gilding, with lots of big angels and chunky putti. A lofty nuns' gallery at the back and screens in the wall either side of the high altar. The ceiling has frescoes depicting The Glory of St Peter of Alcantara, The Glory of the Virgin,The Glory of St Francis, and The Glory of Christ by Giulio Coralli and Michelangelo and Niccolò Ricciolini. The high altarpiece is an 18th-century copy of Domenichino's Communion of Saint Jerome. The cloister has a fresco of the Annunciation attributed to the studio of Sano di Pietro (1460). On the first floor there's a fresco of The Madonna and Child with Saints Anne, Ursula and Mary Magdalene, attributed to Domenico Beccafumi. Also reported is a late 15th-century Assumption attributed to Pietro di Domenico (the angel musicians, God the Father and the prophets) and Matteo Balducci (the rest), Saint Francis Receiving the Stigmata by Girolamo di Benvento and Jesus with the Samaritan by Il Riccio from 1540/50. 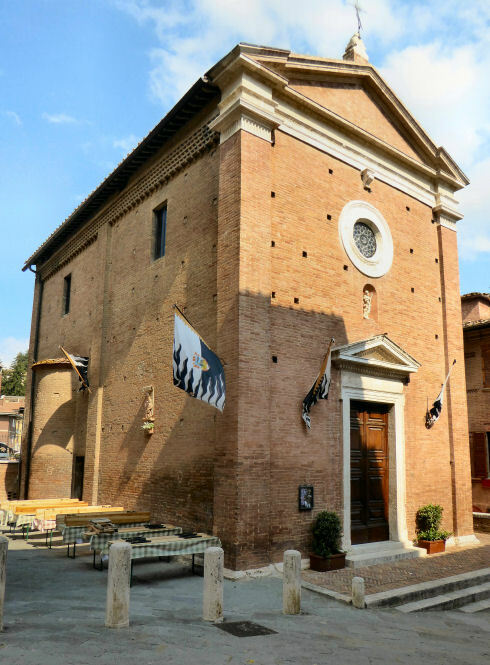 Since 1787 the oratory of the Onda (wave, symbol: dolphin) contrada, building began in 1521, overseen by Baldassarre Giusti . 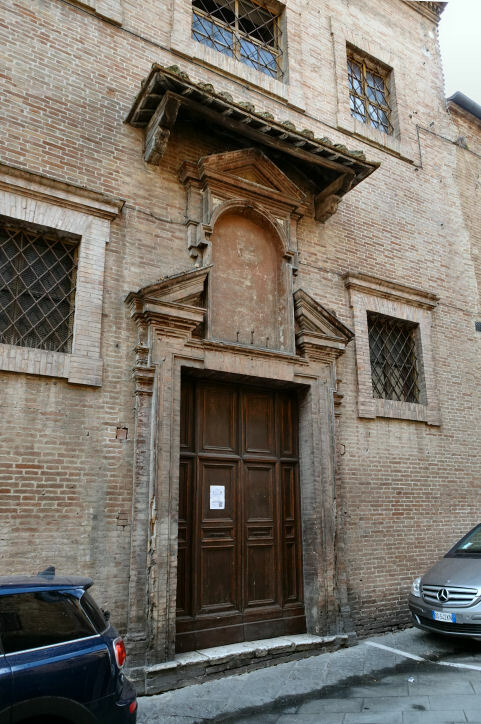 The façade was finished in 1653 with a contemporary bust of the saint by Tommaso Redi over door. A Greek Cross plan, topped by an octagonal dome with a lantern, attributed to Baldassarre Peruzzi or Bartolomeo Neroni called il Riccio. The entrance vault is frescoed with The Life of Joseph by Apollonio Nasini, from 1735. Impressive wooden furnishing, by Pietro di Austo Montini between 1712 and 1720. 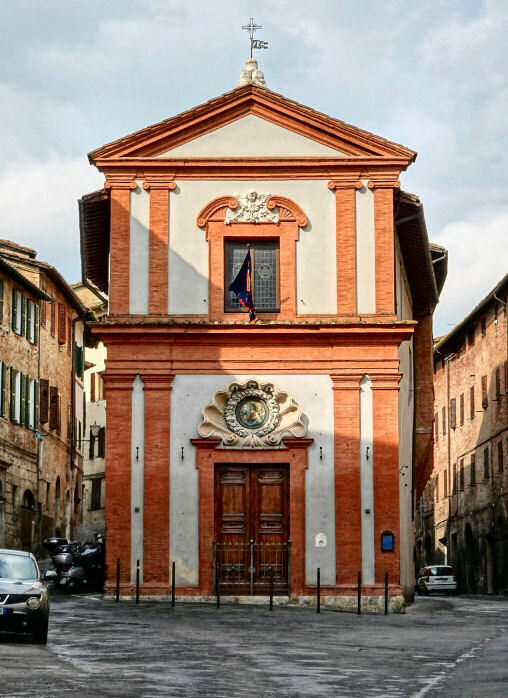 The contrada's museum and meeting hall is in the 16th-century crypt, which has an octagonal vault and houses art and palios won by the contrada. In 1173 the original small church here was occupied by the Order of St. John of Jerusalem, who later became the Knights of Malta. 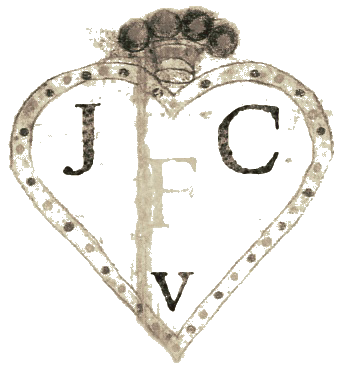 On their suppression, the church was bought by Celso Bargagli who gave it to the parish in 1818. Having been severely damaged by the earthquake of 1798 it was restored in 1938 to designs by the Sienese architect Egisto Bellini, who remade the neo-Romanesque façade and added the belltower. More work was carried out by architect Giovanni Michelucci from 1978, who set out to restore the neoclassical interior with the removal of the altar and other baroque fittings as well as general restoration and the creation of a small museum of the Valdimontone (Valley of the Ram) contrada in the loft area. Mentioned in an 8th century document, and maybe founded even earlier. Present by the 12th century and renovated in the 14th, the current church dates to interior restoration in 1537, with a baroque façade of 1613. Asleless, thick grey pilasters and arches between three altars each side of the nave. Frescoed dome and triangles over a transept that's taller but not deeper than side chapels. The ceiling barrel-vaulted apse ceiling is decorated with a fresco. The inner façade, has a canvas depicting the Immaculate Conception Protecting Siena during the 1526 Battle of Camollia by Giovanni di Lorenzo, commissioned by the city commune in 1528. The third altar on the left has a grand and glowing Nativity of 1522-4 by Beccafumi (commissioned by Anastasia, the widow of Ugolino Ugolini), painted whilst he was working on the Duomo's pavement. The third altar on the right has a late (1636) Circumcision by Guido Reni. Guercino's Martyrdom of Saint Bartholomew is on an altar to the left. A Virgin and Child by Neroccio was recently found here under layers of repainting and restored and unveiled at the Pinacoteca in 2010. A late 14th-century Madonna del Latte by Naddo Ceccarelli, now in the Diocesan Museum. A Crucifix signed and dated 1433 by Sassetta, from the refectory here, sawn up at the end of the 18th century to make doors, three fragments of which are in the Palazzo Chigi-Saracini. The busts of St John and the Virgin were on the arms of the cross, the famous St Martin Dividing his Cloak with the Beggar was at the base. Built for the Carmelites in the 14th century but given a renaissance remodelling in the next century by Baldassare Peruzzi, who was responsible for the high altar in the Duomo and made a name for himself in Rome for, amongst other buildings, the Palazzo della Farnesina for Sienese banker Agostino Chigi. 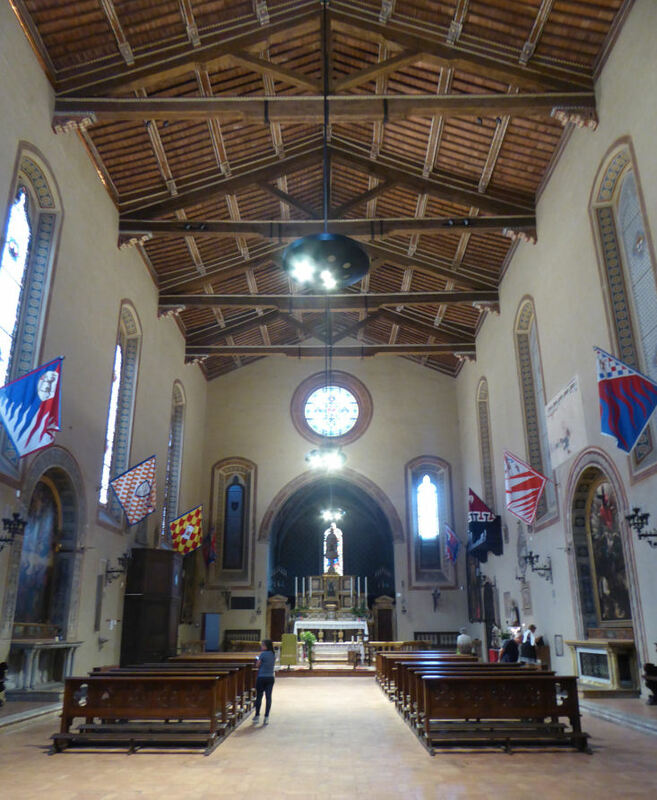 A tall single nave interior with a pair of altars in the middle either side and a pair more alcoves towards the back. To its left is an ostentatiously framed fresco fragment of the Madonna from an Annunciation, by Ambrogio Lorenzetti it is sometimes claimed. 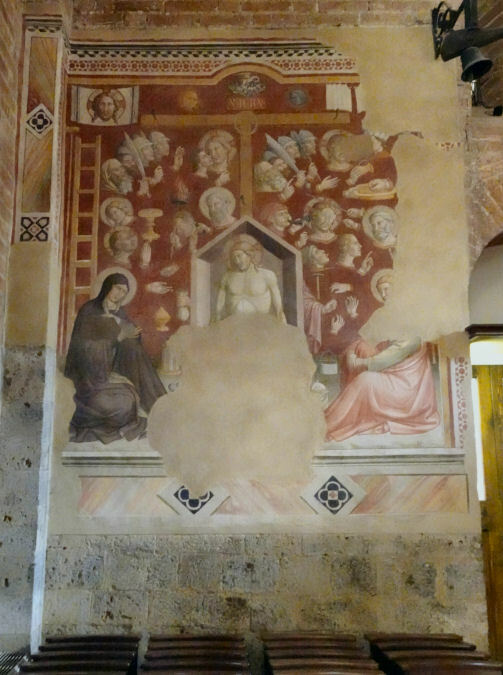 The right wall alcove is full of an impressive lately-uncovered fresco of The Ascension (see right) damaged and missing its Christ, by Benedetto di Bindo. The left wall altar has a panel of The Ascension by Girolamo del Pacchia with a three panel predella depicting the Annunciation to Joseph, the Flight into Egypt and the Adoration of the Magi. There are some 17th century panels about the place. 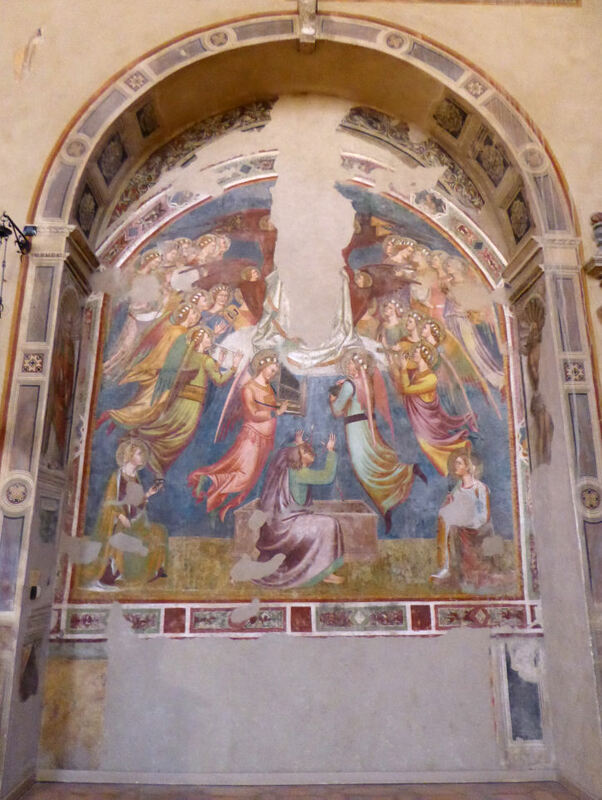 To the right of the apse is the door to the Chapel of the Sacrament with a painting by Sodoma of God the Father and the Birth of the Virgin which when I visited (September 2016) was away being restored. The sacristy evidently has a polychrome terracotta statue of Saint Sigismund by Giacomo Cozzarelli and an Annunciation by Raffaello Vanni. A 13th century Madonna and Child panel by Gilio di Pietro is in the Pinacoteca. Of the large and marvellous Pala del Carmine high altarpiece painted by Pietro Lorenzetti (signed and dated 1329 on the throne base) (see above) the central panel, the Virgin and Child with Saint Nicholas and the Prophet Elijah and the far flanking full-length standing figures of Saints Catherine and Agnes are in the Pinacoteca, with the central-panel-flanking Saint John the Baptist and Elisha panels now in the Norton Simon Museum in Pasadena. The impressive predella (depicting episodes from the history of the Carmelite order) and two pinnacles are also in the Pinacoteca. Another pinnacle is in the Yale University Art Gallery and at least one is missing. They depict pairs of apostles. The dispersing was because, what with the Counter-Reformation and changes in taste, the altarpiece was sent, without two side compartments, to the church of Sant'Ansano a Dofana. At this time the prophet Elijah to the right of the Virgin, was repainted as Saint Anthony Abbot. The panels that remained in Siena soon ended up on the market. 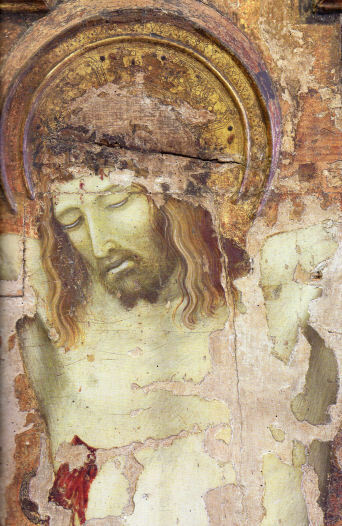 A very damaged Crucifix of c. 1328/30 by him from here is also in the Pinacoteca. It was found to be in a deplorabile stato when the church was suppressed, and underwent restoration for the 2017/18 Ambrogio Lorenzetti exhibition in Siena but still looks very rough (see detail right). Recent scholarship ascribes it to Ambrogio. Also in the Pinacoteca is Bernardino Fungai's Virgin and Child Enthroned, with Saints Sebastian, Jerome Nicholas and Anthony of Padua (1512), his only signed and dated work. So all the scholarship on Fungai flows from this work. Some predella panels in the Howard University Gallery of Art in Washington are said to be parts of this altarpiece. Christ Suffering and Christ Triumphant by Giovanni di Paolo (see far right) and? 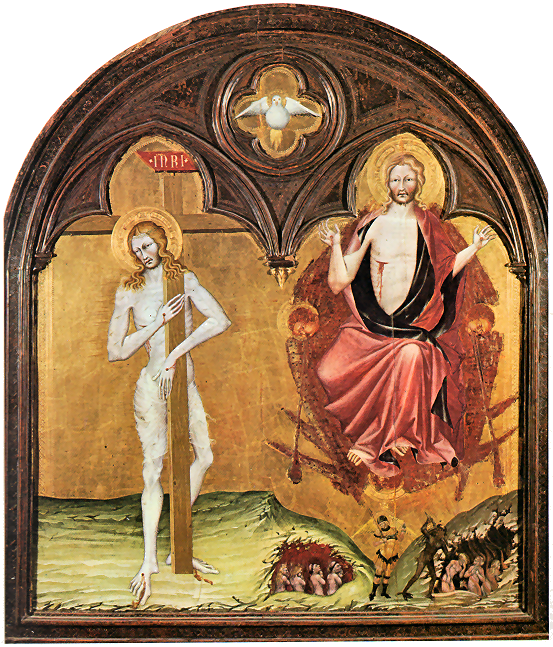 a polyptych of 1453 by him for the high altar here, are also in the Pinacoteca. 16th century with frescoes by Giuseppe Nicola Nasini of 1710. Can be entered via no.4 Via della Diana and now offers somewhat spartan, it seems, tourist accommodation. Fra Filippo Lippi, the Florentine artist, was subprior here early in his carreer, from November 1428 to August 1429, so exciting modern art historians in their conjectures about the direction of the flow of inspiration between artists in Siena and Florence. I found the church open one evening in 2016 and staffed by a very helpful and knowledgeable young woman from the university next door. But I've since learned that I was very lucky, and indeed I never found it open during two subsequent stays. Originally established as part of the convent called the Spedele di Monna Agnese, a charitable foundation founded around 1280 by Monna Agnese, given property by Orlando Malavolti. The hospital was originally for young widows and pregnant girls and was managed by lay persons. The complex was named in Sasso for being built on pebbles. 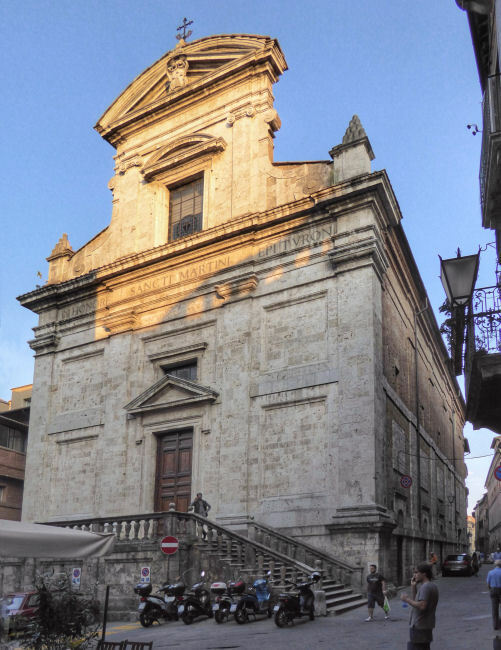 In 1565 the structure passed to the Ospedale of Santa Maria della Scala and soon afterwards the church was completely renovated taking on its current form. Suppressed at the end of the 18th century, hospital functions moved to Santa Maria della Scala and the rooms here were made into a girls' school. The deconsecrated church was put to various civil uses until, in 1995, it became part of the Museo dell'Opera of the Duomo and is now the museum gift shop which you leave through. 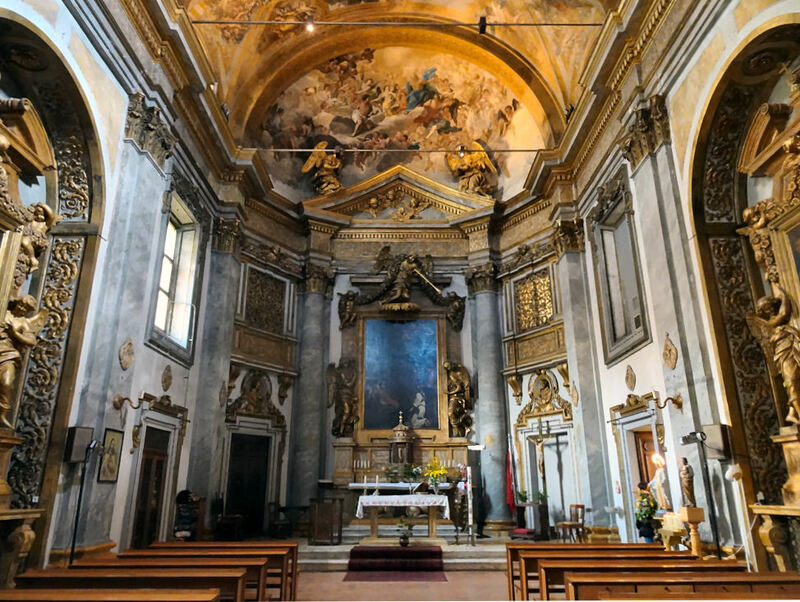 The church is now overwhelmingly late baroque inside, with stucco decoration by Ludovico Chiappini and painted panels by Giambattista Giustammiani from the early 17th century, mostly depicting stories from The Life of the Virgin. Also early 17th century are the altarpieces by Francesco Vanni (the high altarpiece depicting The Virgin and Child Enthroned, with Saints Lawrence, Gregory Nicholas and Agnes), Rutilio Manetti (who contributes two), Astolfo Petrazzi, Raffaello Vanni and Niccolò Tornioli (a Crucifixion of 1631/2). A 1342 altarpiece of the Presentation of the Virgin, a fine late work by Ambrogio Lorenzetti, is in the Uffizi. A panel of the Allegory of Redemption, also by Ambrogio, is in the Pinacoteca. It's thought that they were originally once part of an altarpiece for an altar dedicated to St Crescentius in the Duomo. They both ended up in the Spedale di Monna Agnese from which they were later dispersed, The Presentation going to the Florence Accademia in 1822. First documented in 1050. A hospital called Santa Maria della Misericordia was founded here in 1240 (and enlarged in 1321) by Beato Andrea Gallerani, the founder of the Opera della Misericordia, a charitable foundation set up to look after orphans and the elderly. The second niche on the right contains his portrait (see right) possibly by Lippo Memmi, who may also have been responsible for the Saint Paul in the fifth niche on the right, and the matching Saint Peter in the fifth niche opposite. 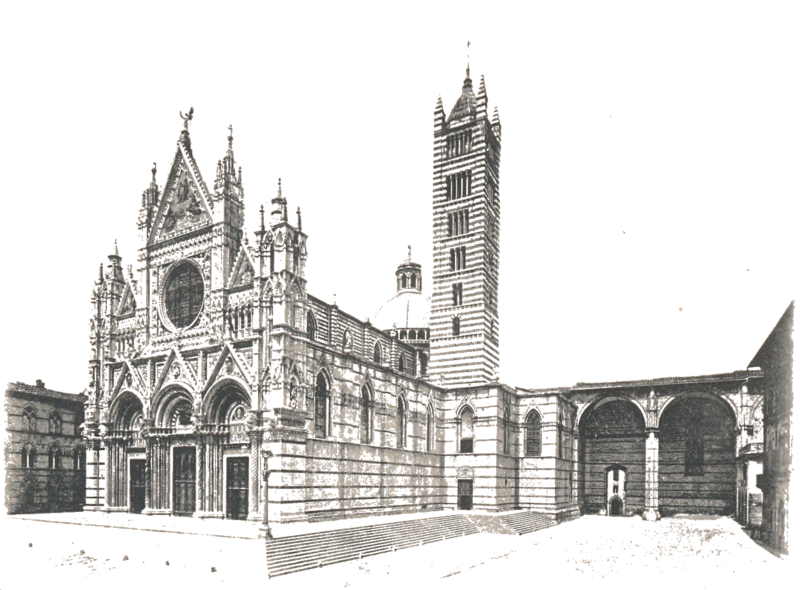 The hospital was suppressed in 1408, part of it passing to the University of Siena, who built the Accademia Fisiocritica in 1691 to designs by Pirro Maria Gabbrielli. In 1758 a library founded by Sallustio Bandini opened there. Much rebuilding work on the church with a major reconstruction in 1767 by Marchetti. Interior work in the 17th century. Now called Sant'Anastasia used for Russian orthodox services. 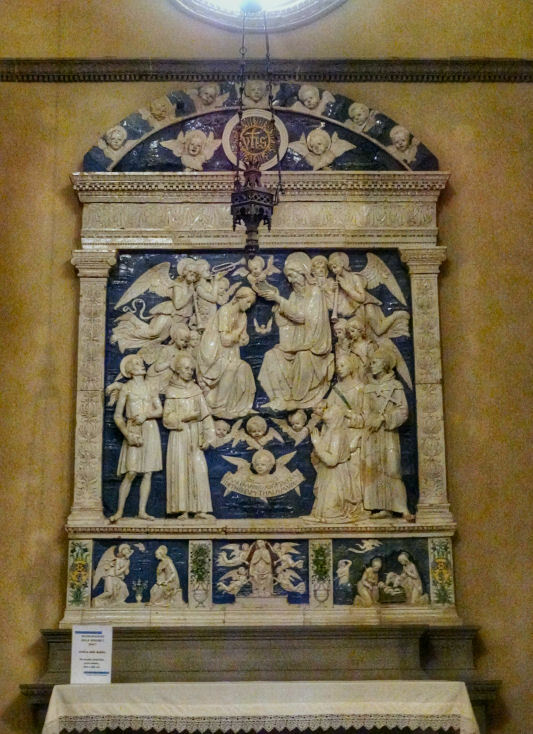 Six statues remain of the eight of Sienese saints, including Catherine, installed in niches inside in 1772. The ceiling is frescoed with stories of the Life of the Virgin. The high altar has a Birth of the Virgin by Giuseppe Nicola Nasini. A small marble slab depicting The Crucifixion, sometimes controversially given to Sienese goldsmith Guccio di Mannaia, is said to have inspired the depiction of the Three Marys in Pietro Lorenzetti's fresco of The Crucifixion in San Francesco. A very Lorenzetti-influenced Saint Michael Enthroned, with Saints Anthony Abbot and John the Baptist (1370/75) by Angelo Puccinelli, an artist from Lucca, is in the Pinacotaca. As are panels from an altarpiece painted early in his career by Sassetta for the Arte della Lana (woolworkers' guild) in 1423. 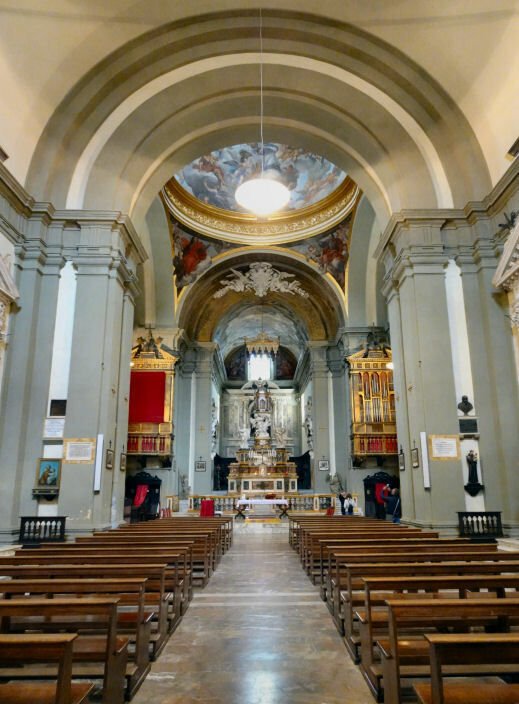 It was commissioned originally to be placed in S Maria del Carmine but was moved here in 1463, It was divided up around 1777 when the Arte della Lana's chapel was destroyed. 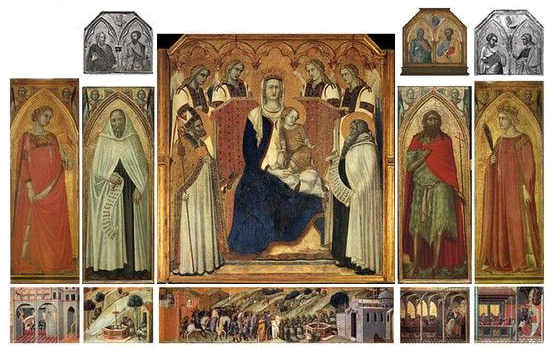 The predella panels included the Vision of St Thomas Aquinas (Vatican Museum), St Thomas in Prayer (Budapest), the Miracle of the Sacrament (Barnard Castle UK), the Last Supper (Pinacoteca), the Burning of a Heretic (National Gallery, Melbourne) and St Anthony Beaten by Devils (Pinacoteca). Several pinnacles and pilasters are also in the Pinacoteca. It has also been suggested that the Angel of the Annunciation (Massa Marittima, Pinacoteca) and the Virgin Annunciate (Yale U) belonged to this altarpiece, as well as two landscapes, Castle by the Sea and City by the Sea (both in the Pinacoteca), usually attributed to Ambrogio Lorenzetti. The building dates from 1909, but as early as 1841 a rich widow called Lady Olivia Bernhard Sparrow, a strong evangelical and a friend of William Wilberforce we are told, had dominated a small group of Anglican worshippers in the city. In 1907 a church building fund was started and in March 1908 land was bought in Via Garibaldi, with funds provided by Mrs Georgina Allinson Hignetti, and on April 18 1909 services were held for the first time in the medieval style church. Wednesdays 11-1pm, with a service at 12.30pm. 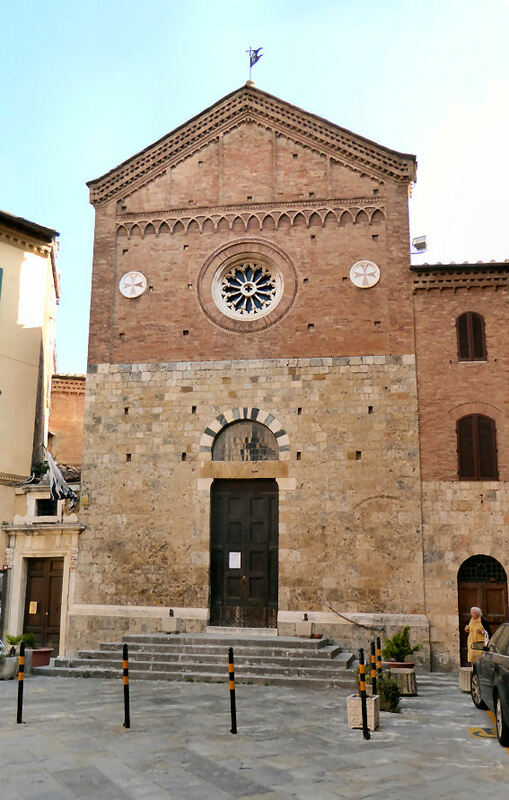 The original 13th century Romanesque church was probably the Franciscans' first home in the city before the building of San Francesco nearby. Interior rebuilding in 1753. A small fourteenth-century cloister was revealed by restoration work and is visible from no. 28 Via del Giglio. In the left aisle near the door are fresco fragments of an Annunciation and a copy of a Maesta painted in 1350 by the anonymous Maestro di San Pietro a Ovile. The right wall of the apse has fresco fragments probably by Bartolo di Fredi. Wooden sculptures of the Madonna and John the Evangelist from 1415 by Domenico dei Cori, probably made for the Duomo but troublesome circumstances brought them here - they are now 'temporarily' in the Opera museum. A Virgin and Child Enthroned with Four Angels by Bartolomeo Bulgarini from the late 14th century. A panel showing Saint Peter by Luca di Tommè from the 1380s. A Virgin and Child panel of the 1390s by Andrea di Bartolo di Fredi. A mid-15th century painted Crucifix by Giovanni di Paolo. 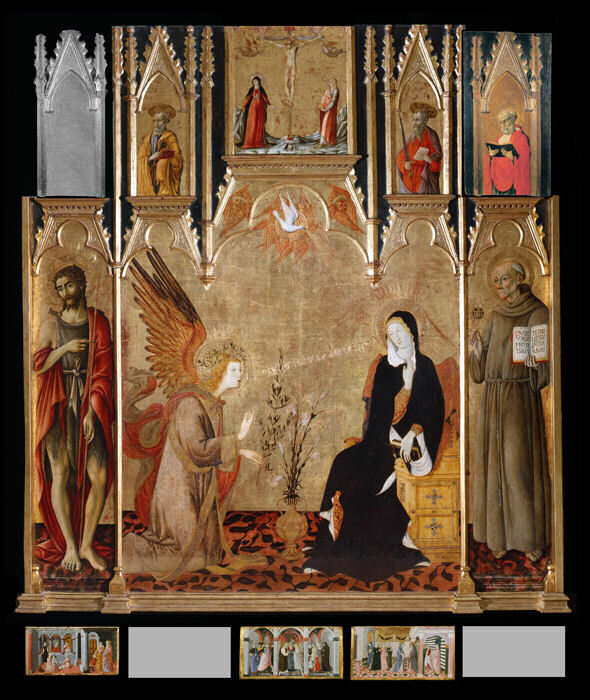 An Annunciation with Saints triptych (see left) commissioned from Matteo di Giovanni in the early 1450s by this church's rector, Mariano di Nanni is now in the Diocesan Museum. Its central section looks very like Simone Martini's famous Annunciation (painted for the Siena Duomo but now in the Uffizi) and is topped by pinnacles of the Crucifixion and Saints Peter and Paul. (The top far right pinnacle is not on display in the Diocesan Museum). The flanking main register panels depict Saints John the Baptist and Bernardino. The predella panels, scenes from the Life of the Virgin, are in the Louvre and Philadelphia. A 16th-century Sienese head of Christ Carrying the Cross. A post-mannerist Pietà by painter and architect Santi di Tito (late 16th century). Opening times Was quite recently used as a university lecture hall. Currently closed. Documents tell of a church here as early as 998, built after houses and vineyards were donated by Counts Bernardo and Gualfredo Ranieri, and their cousin Guilla. The church belonged to the Knights Templar from the 12th century (as mentioned in a document from 1148. With the suppression of the Templars in 1312, the church passed to the Knights Hospitaller who later became the Knights of Malta. With the abolition of that order the church passed to the Diocese. Romanesque, but with a too-big 14th century gothic doorway attached and a brick renaissance chapel, built 1523/6, stuck on to the right. Romanesque interior was restored in 1957, which resulted in the raised presbytery and the plain semi - circular apse, which contains a Gothic tabernacle from the second half of the 14th century. Rough stone, single nave, with a timber roof and one niche altar either side. Detached fresco and sinopia panels. Also a Madonna with Saints John the Baptist and Peter by Diego Pesco, fragments of frescoes (a Cruxifixion and Old Testament Stories) by Cristoforo Bindoccio and Meo di Pero. The chapel on the right was erected in 1523-26 as an ex voto for the passing of the plague. 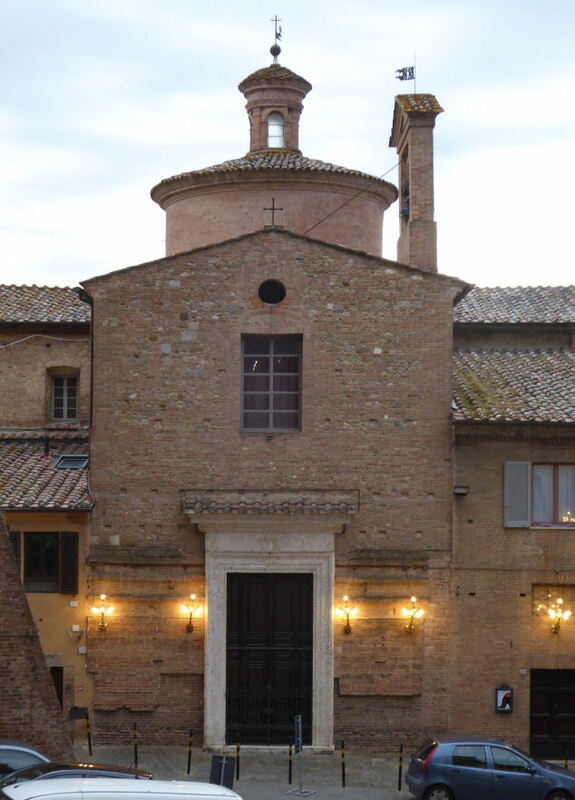 It houses a Martyrdom of St Donnino and Saint Hugh by Antonio Nasini/questionable? and a fragment of a Madonna with Child attributed to Lorenzo Rustici/Bartolomeo Neroni called Riccio? 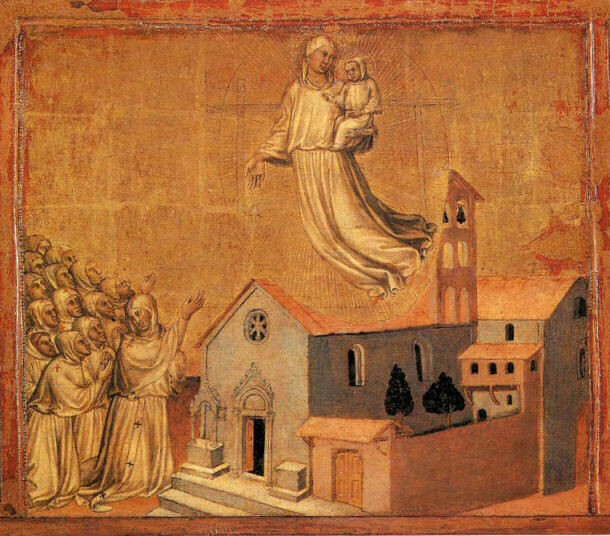 Apparition of the Virgin Over the Church of the Magione. Now in the museum of the Banca Monte dei Paschi. 13th century originally but transformed in the 18th century. Wide, plain, no aisles, and not much art, with one altar each side of the nave. The right-hand one has an unlabelled painting with a light to turn on, which just shows its texture. There is modern stained glass at clerestory level on the right, over the entrance, and on the walls of the choir. The choir and transept are the same width and merge into one hall-type space, with an octagonal dome over the altar. A standard painted for the lay Compagnia di San Rocco by Rutilio Manetti, with Saints Roch and Job Intercessing for Siena on one side and Saints Catherine of Siena and Roch on the other is in a glass case in the left transept. The five panels from a dismantled polyptych attributed to Ambrogio Lorenzetti (c.1340) (see below) have now been returned to the back wall to the left of the high altar, in the framing made for the 2018 exhibition, but now unlabeled. 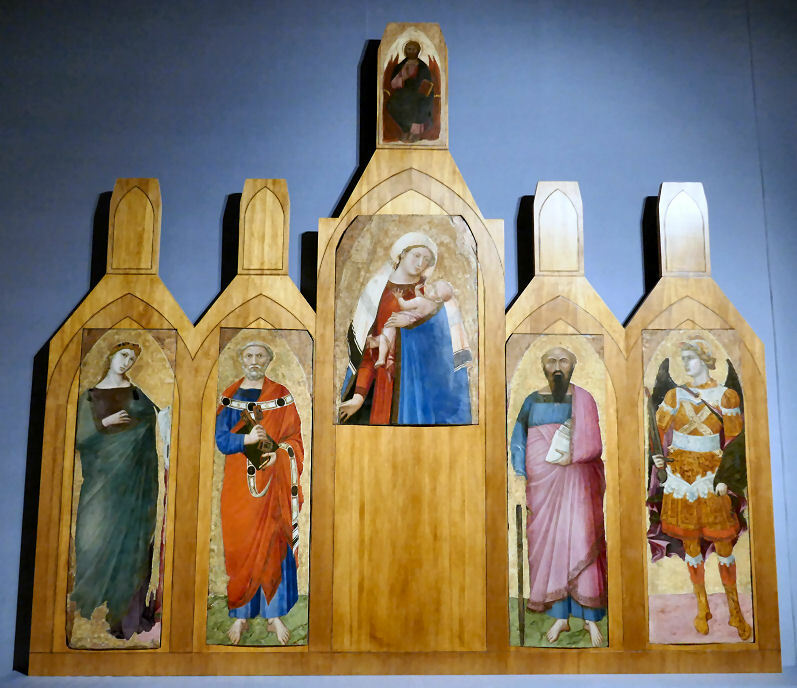 The five panels from the dismantled polyptych were restored for the major Ambrogio Lorenzetti exhibition in Siena in 2017/18 where the photo below was taken. The centre panel seems to have oddly depicted the Virgin standing, and holding a very wild looking Child. The side panels show Saints Cecilia, Peter, Paul and the archangel Michael. The centre pinnacle, Christ Blessing, used to be in the Museo Diocesano. The four side pinnacles and all the framing are lost. The polyptych had been in the church since at least the early sixteenth century, but by 1785 had been removed from the high altar and broken up and remained little known until well into the 20th century. It's attribution has been doubted, having swung from a follower of Lorenzetti to 'Lorenzo Lorenzetti' – an invented painter-father of Pietro and Ambrogio. 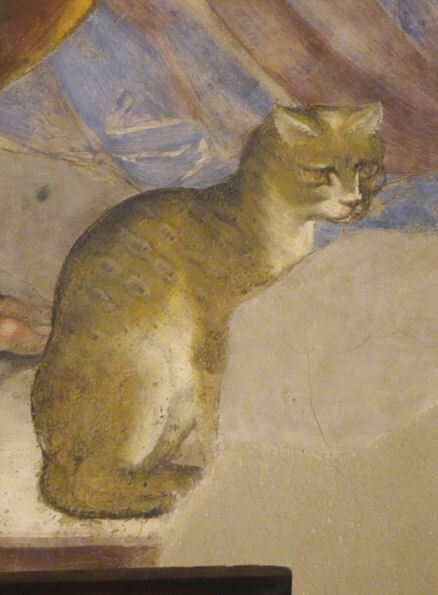 The recent restoration has swung opinion back to the attribution to Ambrogio himself. A panel depicting Saint Bartholomew from a polyptych finished in 1451, begun by Sassetta and finished by his colleague Sano di Pietro upon Sassetta's death, is in the Pinacoteca. As is Sano di Pietro’s solo Saint Francis from the same altarpiece, which was commissioned by Bartolomeo di Francesco Guglielmo for his chapel dedicated to Christ’s Nativity here. Sassetta's panel of the Blessing Redeemer, previously given to Nicola di Ulisse, from the same altarpiece, is in the Diocesan Museum, still labelled as by Nicola. Individual panels of the Madonna and Child, an Annunciate Angel (see right) and Saint Lucy by Sano di Pietro are in a glass case in the Diocesan Museum. Built from 1660 by Sienese architect Benedetto Giovannelli Orlandi for the Chigi family, whose arms are still huge and high on the façade. The architect was asked to create the façade and the short road leading up to it. The vault was damaged in the earthquake of 1798. Baroque, congested and aisleless, with much white and gilded plasterwork, of course. The nave is square with a painted dome ceiling. There are three large altarpieces, over the main and each of the side altars, and eight small panels. All 17th century and sweet bordering on insipid. The Nativity by Alessandro Casolani was left unfinished at his death in 1607 and completed by Francesco Vanni. The tomb of Aurelio Chigi very noticeable in the centre of the aisle. The entrance hallway under under the organ retains its screen. The old sacristy is off the left here and has a large case of reliquaries and the like and two nice 15th century gold ground Madonnas by Sano di Pietro (con Bambino) and Domenico di Bartolo (Assunta, head and shoulders) and a Jacopo della Quercia full size carved & painted wooden Saint Catherine of Alexandra. Nicely kept and staffed by volunteers, I found, from the Fondazione Conservatori Riuniti di Siena. A 16th-century structure, with 17th-century works by Rutilio Manetti (frescoes of the Life of San Rocco from 1605-10), Raffaello Vanni and others. The home of the Lupa (she-wolf) contrada since 1789. The district's museum here has an altarpiece of The Apparition of the Madonna before San Rocco signed in 1603 by Ventura Salimbeni. A church is first mentioned here in a document dated 1230. The Umiliati were here first, then the Servites. An oratory was built in 1589, dedicated to the Visitazione di Maria Santissima and used by the Contrada dell'Onda. 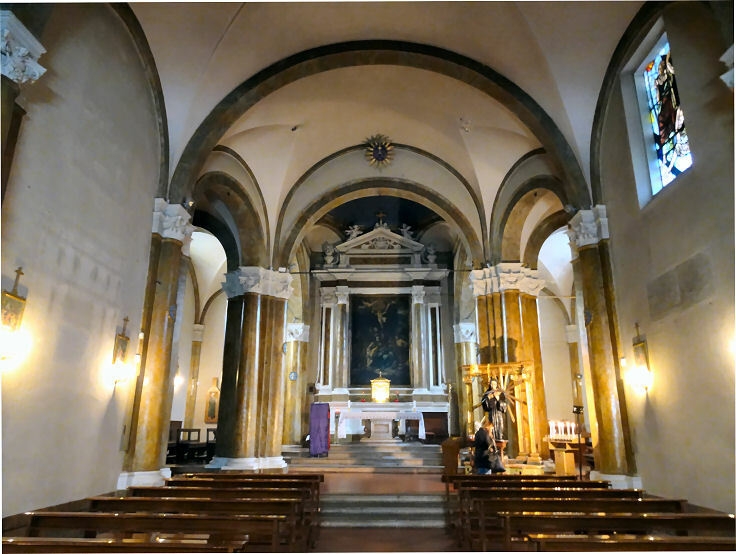 In 1729 the oratory was restored and became the church of San Salvatore. 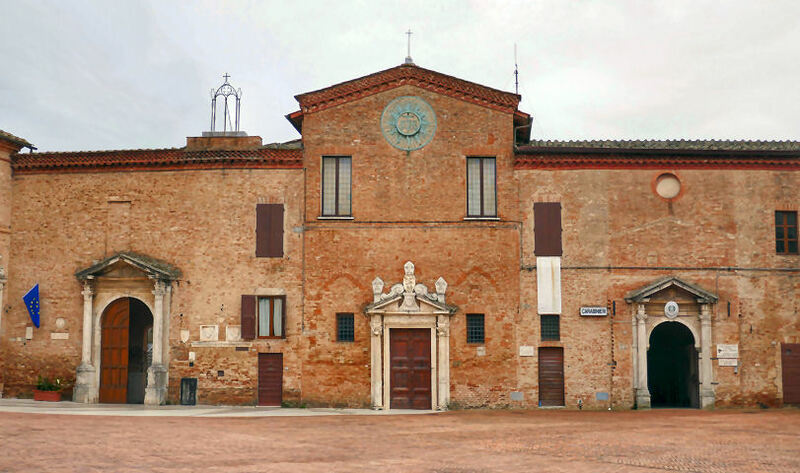 From 1602 to 1787 the oratory was the seat of the Contrada dell'Onda, when San Salvadore was suppressed and the Contrada obtained the Oratory of San Giuseppe from the Grand Duke Pietro Leopoldo. The contrada's valued painting of the Virgin and Child moved at this time to San Giuseppe. Built by the Weavers' Guild from 1493 to 1550 with rebuilding in the 1650s. Over the altar is the Madonna of the Forest in stucco and polychrome terracotta from c.1474. It is attributed to Francesco di Giorgio Martini who is also said to have designed the church. 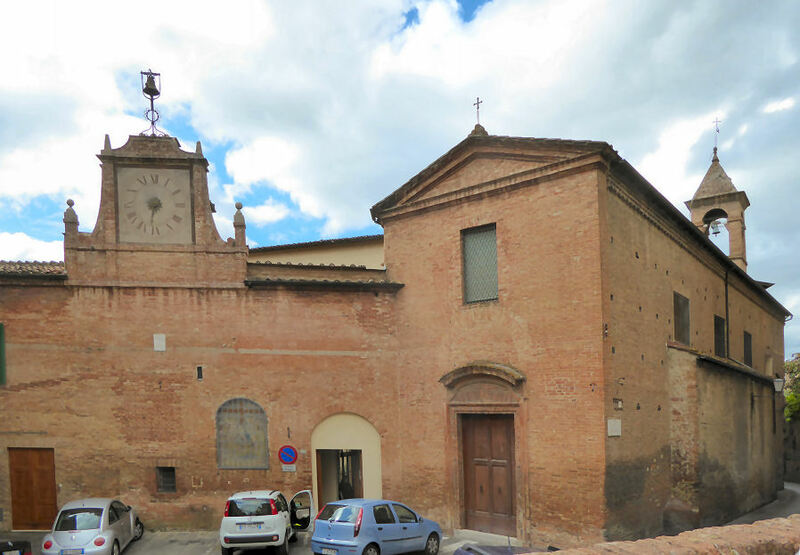 This has been the church of the Selva (Forest) contrada since 1818. The 15th century crypt houses the district's museum. There are late-16th early-17th century frescoes inside by Pietro Sorri, Giovanni Paolo Pisani and Raffaello Vanni. The paintings by 17th century Sienese artists mostly depict the life of the saint, Rutilio Manetti being the most accomplished. Originally a parish church built by the Ugurgieri family, the church passed to the the Camaldolese order in the 11th century with their convent next door. The church burned down in a fire in 115, and was rebuilt by 1231. In 1420 the monks were expelled and in 1556 passed to the Jesuits, who rebuilt the church from 1561 and continued to refurbish until 1775. When the Jesuits were suppressed in 1759, the church was acquired by the Vallombrosan order, who had the facade rebuilt in its present form by architect Antonio Matteucci. When the Vallombrosans were suppressed in 1816 the Grand Duke of Tuscany gave the church to the University of Siena, who are still here. Aisleless with three deep chapels each side. Plain walls but the chapels and semi-circular apse are very decorated. The ceiling is decorated with fifteen canvases in various shapes and sizes by Raffaello Vanni depicting The Last Judgement. 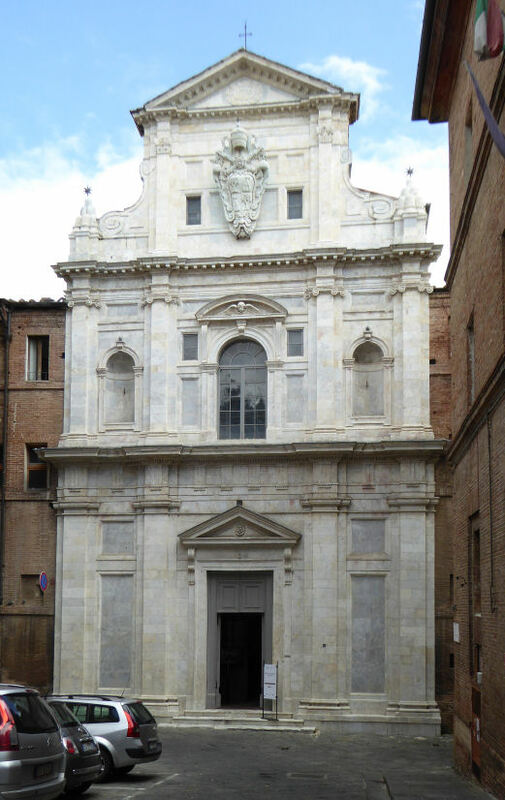 The chapel of St Francis Xavier has works by Francesco Vanni and Baldassare Franceschini. 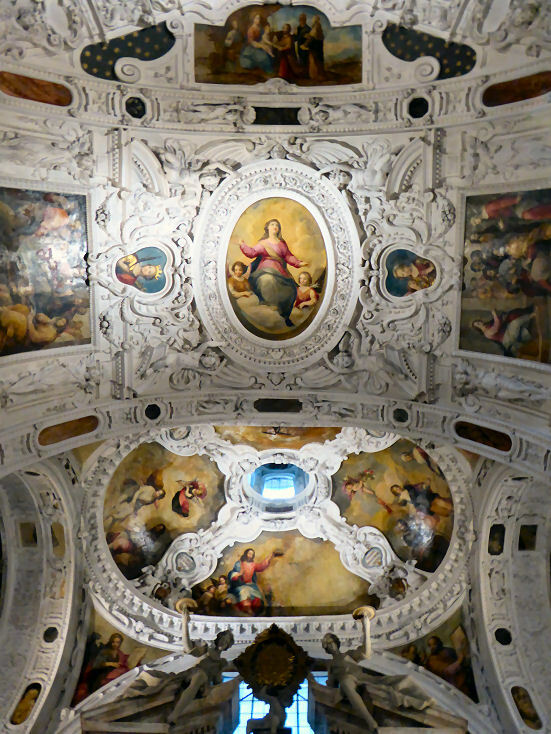 The chapel of the Madonna di Loreto is decorated with canvases by Francesco Vanni of The Assumption of the Virgin and The Translation of the Holy House. The high altarpiece depicting the Glory of St Ignatius is by Mattia Preti. Flanking it are two canvases by Francesco Vanni depicting Louis Gonzaga and Stanislaus Kostka.